Ubax Theme Ubax restaurant website theme will help you build a fresh company image on the internet. Show how good your food is with restaurant website from UpMenu. Run online ordering and earn more. New website design Ubax Theme can bring a lot of benefits to your restaurant. It was created by UpMenu. You can manage it through clever CMS. The template is also connected with UpMenu system so it is easy to make updates whenever you want to. Add a touch of beauty The beautiful appearance shows that you are a professional who cares for the guests. 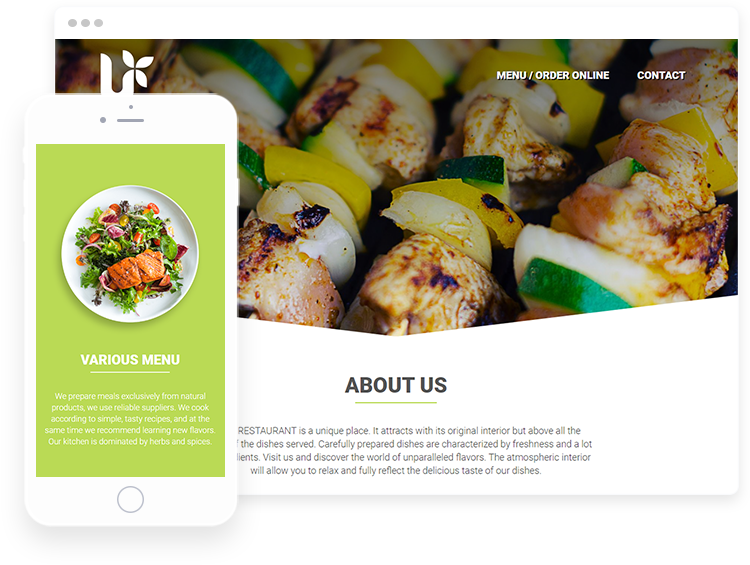 Restaurant website template should encourage customers to trust your food place. Ubax Theme consists of large pictures, interesting shapes, and clear fonts. You will also receive template restaurant support with your purchase. Professionalism and style This restaurant website theme is a great choice for food places with a warm, pleasant atmosphere. Ubax Theme looks also very modern. Do you manage a family restaurant, cozy café or pancake place? This template will help you show your guests that you always want them to feel nice. Let your customers enjoy a change There are many website templates available on the Internet. However, not all of them are as professional and stylish as Ubax Theme. Choose this template and gain more customers. If you do that, sales will likely increase in no time.